The federal government is the largest customer and money provider in America, spending about $3.8 trillion dollars per year on goods, services and benefits. This compares with under $12 trillion for the entire domestic business sector. The federal government employs as many people as the top nine civilian employers – Wal-Mart, McDonalds, UPS, Sears, Home Depot, Target, IBM, GM and GE — combined. The President, the Tea (formerly Republican) Party, the Democrats, the media, most columnists and old-line economists agree federal spending should be reduced and/or federal taxes increased. The goal: To reduce the federal deficit. The two biggest problems facing America are the recession and the related unemployment. 1. What do businesses do when their biggest customer reduces purchases? Do they fire employees, reduce purchases of goods and services or both? 2. When businesses fire employees, or reduce purchases of goods and services, how does this stimulate the economy or cut unemployment? 3. What do individuals do when their salaries and/or benefit checks are reduced? Do they spend less, save less or both? 4. When individuals spend less or save less, how does this stimulate the economy or cut unemployment? 5. Considering all of the above, how does a reduction in federal spending and/or an increase in taxing (aka “deficit reduction”) solve our two biggest related problems: the economy and unemployment? These questions never are asked, much less answered, because the politicians do not care about the answers. Their prime concern is not the working (or non-working) Americans. The politicians prime concern is who gets elected, i.e., power. President Obama, the Tea (formerly Republican) Party and the Democrats all have the same goal, with the differences being only in the execution. And I use the word “execution” intentionally, because whoever “wins,” the American public will lose. We, our children and our grandchildren will suffer the execution of joblessness, poverty and loss of health and lifestyle. Our great American dream will be shattered — needlessly — all for the greed, ambitions and ignorance of the politicians. While we stress about traitors at Fort Hood, we give a free pass to traitors in Congress, who intentionally do more harm to America than al Qaeda ever could. Congress and the President insist the federal deficit must be reduced. There are but two methods for reducing the deficit: Increase federal taxes and/or reduce federal spending. Both methods reduce the number of dollars in the U.S. economy. Congress and the President remain ignorant. They continue to call for increased taxes and/or spending cuts. The depression cometh. Lately I’ve been seeing this image published more often, in various media. This surely is the most misleading, downright untruthful sign you ever will have the misfortune to encounter. It’s untruthful because it shows the gross federal debt, which includes money the federal government borrows from itself. While the Gross Federal Debt is around $14 trillion, the net debt is only about $8 trillion — well below the debt ceiling (another misleading, untruthful gimmick). Sadly, Congress and the President pretend not to understand that. So they injure our economy about something that isn’t real. 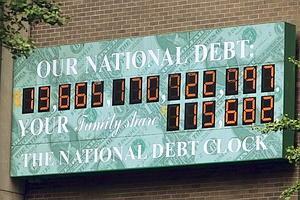 The misleading part of the sign has to do with the words, “Your family share.” Most people interpret those words to mean their family owes a share of the gross federal debt, which as we have seen, is a fake number. But worse, your family does not owe a share even of the net federal debt. Your family could more accurately be said to own a share of the debt. The federal so-called “debt” is the total of outstanding T-securities. When the government “borrows” it debits the “lender’s” checking account and credits the lender’s savings account (aka T-security account) at the Federal Reserve Bank. No dollars are shipped anywhere. It’s just an asset exchange accomplished by a debit and a credit. When the government pays its “debt,” the process is reversed. The checking account is credited and the savings account is debited. At no time are taxes involved so at no time do you or any other taxpayers owe anything. Whether taxes are $0 or $100 trillion, the federal government’s ability to debit and credit bank accounts does not change. Buying a T-security is essentially identical with transferring dollars from your checking account to your savings account. You could be said to own a share of the debt, because federal debt is a measure of money in the economy. You are part of the economy, so that money benefits you. The greater the “debt,” the healthier the economy. I don’t know whether the Durst family, which owns and maintains the clock, knows what it really means. They may be forerunners of the Tea Party, those clueless folks who hate government but love their Social Security, Medicare and Medicaid checks, their safe food and drugs, their highways, army protection, scientific research, FDIC security, homeland security and the myriad other perks provided by the federal government. It’s enough you to know that every time you see that sign, you see economic ignorance at work.